He shrugs off blowback from colleagues who fear another government shutdown. (Bloomberg) – Sen. Ted Cruz vowed today to use a debate over raising the federal debt ceiling as leverage to extract a new round of U.S. spending cuts, even as House Speaker John Boehner told reporters that defaulting would be “the wrong thing” for the country. Cruz, the Texas Republican who led the fight to defund Patient Protection and Affordable Care Act (PPACA) that contributed to a 16-day partial government shutdown in October, said he wouldn’t give in to Democratic demands to raise the debt limit without conditions. Cruz, 43, attracted national attention in September when he controlled the Senate floor for 21 hours, arguing against Obamacare, and at one point reading Dr. Seuss’s “Green Eggs and Ham” to fill time. 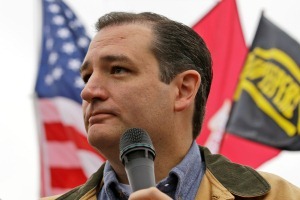 Cruz is a leading voice among lawmakers aligned with the small-government Tea Party movement. Cruz’s comments came as Boehner, an Ohio Republican, refused to say whether House Republicans would seek to attach spending reductions to a debt-ceiling increase. House Republicans are holding a policy retreat in Cambridge, Md., today and tomorrow to plan their strategy for raising the federal borrowing cap four months after a dispute over funding the government brought the U.S to the brink of default. Oregon Rep. Greg Walden said today that Republicans have been chastened by the shutdown fight. The party has “to be very thoughtful about our approach and make sure that whatever lever you think you’re grabbing actually is connected to something in terms of its power and that you aren’t going to be forced to let it go at some point,” said Walden, chairman of the National Republican Congressional Committee, the campaign arm for House Republicans. Treasury Secretary Jack Lew has said Congress should raise the debt ceiling as soon as possible, and that the U.S. will reach its borrowing limit by late February. President Barack Obama and Senate Majority Leader Harry Reid of Nevada have said Democrats won’t accept any conditions on raising the debt ceiling. Obama shouldn’t get the “blank check” he’s seeking to raise the debt ceiling without structural changes to address the underlying causes of the nation’s debt, Cruz, a freshman senator, said in an interview today with Bloomberg Television. Cruz, in the interview, accused Obama and congressional Democrats of acting as a “scare monger” by playing up the possibility of a U.S. default to gain political advantage. “I intend to continue fighting as hard as I possibly can to make D.C. listen, to force this town to address the real problems so we can pull back from this fiscal and economic cliff, because the window to turn this around is not long,” Cruz said. Cruz said he remains committed to repealing and dismantling PPACA. When pressed today on whether he would reprise the battle over the law as part of the debt- ceiling debate, Cruz in the Bloomberg Government breakfast said he preferred to focus on spending cuts. Cruz predicted that PPACA would be repealed during Obama’s presidency, maintaining that the backlash against Obamacare would lead Republicans to win enough seats in November for a Senate majority. If the House and Senate were both under Republican control, keeping the law in place would prove untenable politically, he said. He credited last fall’s Republican effort to defund the law with “elevating the debate over the harms that Obamacare is causing,” adding that was a “spectacularly foolish decision” for Senate Democrats to be defending the law. “How do we repeal Obamacare? We continue making the case to the American people,” Cruz said. Cruz suggested he wasn’t fazed by the criticism he has been receiving from fellow Republicans. Asked about discussing his views with the Republican leadership he cracked that he’s not getting phone calls from Senate Minority Leader Mitch McConnell and House Speaker John Boehner. Cruz ducked a question about running for president in 2016 but he did outline the requisites for a Republican candidate; one that seemed to best fit Ted Cruz.